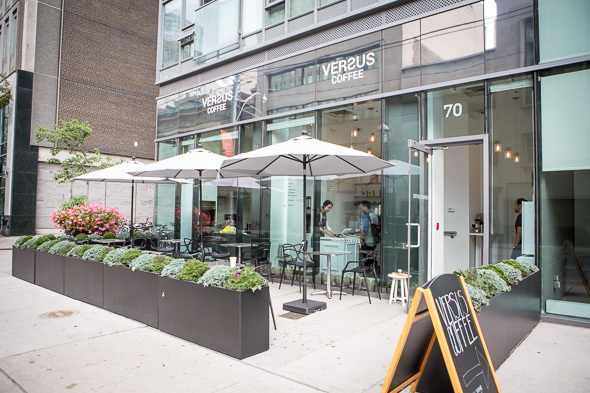 Versus Coffee is a small shop with a big patio on Adelaide just east of the Financial District. They serve standard espresso-based coffee drinks and tea as well as novel twists on lattes. The space is small but they make up for it with high ceilings and a chic, all-white modern look. Mirrors and big floor-to-ceiling windows help the space feel bigger than it is. The funky and surprisingly comfy chairs that dot the patio were sourced from Home Craft Decor . Their coffee comes from de Mello Palheta Roasters . 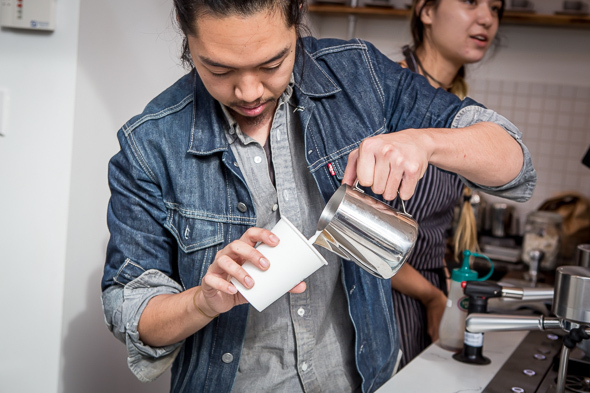 The guys who run the roastery are experts, so it's easy for them to just take care of everything when it comes to the beans, leaving owner Anthony Ayachi to run the cafe. 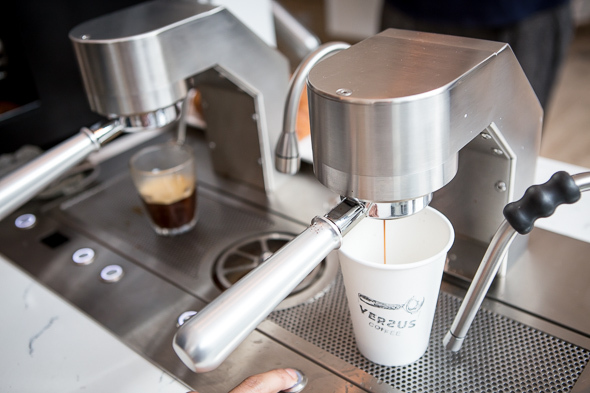 Versus uses their house blend, Dancing Goats, to ensure reliability and consistency. 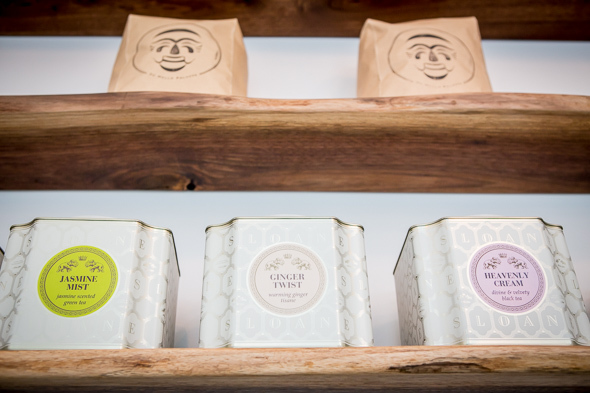 The teas are from Sloane , another local shop. Available teas include green jasmine, mint, and Sloane's Heavenly Cream, a velvety black tea. Astonishingly, Versus makes their own chai for their lattes in house. 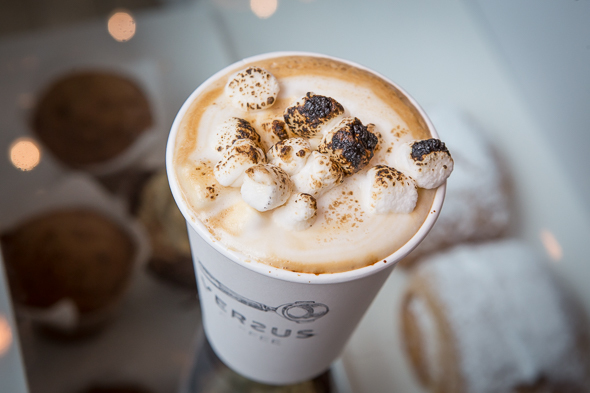 A delightful creation you'll only find here at Versus is the campfire latte ($5.25). It's a maple latte made by blending maple syrup right into the espresso, topped with marshmallows that are then bruleed (or "roasted") via blowtorch. Something else that's special to Versus, and ties in with their clever space-saving mentality, is the below-counter espresso machine from Mavam . The interactive elements are on the counter and the main machine with water reservoir and boiler is below. I'm assured it's designed for the highest level of thermal preservation and water temperature consistency. When we arrive at Versus they're experimenting with some different toasts, tweaking what they want to offer. They feel coffee and high-end toast simply go well together, with options on any given day potentially including Monte Cristo, berries and cream, banana cream, or apples and cinnamon ($4 - $8...most importantly, toasts will never rise above $10). For die hard cold brew fans, I'll also mention that they stock mickeys of Keep It Cool from Montreal, a brew Ayachi personally swears is second only to Blue Bottle's .